Over the course of four years, Edmonton Oilers owner Daryl Katz has gone from local hero to shady business man. Why the change in perception? One can easily point to his demands for a new arena, funded by taxpayer dollars. Or to his subtle threats to move the team to Hamilton, Quebec City or Seattle. But in the case of Daryl Katz, there’s something deeper than these recent events that has changed his public image. And unfortunately for Katz, these changes are difficult to reverse. Daryl Katz is chairman and CEO of the Katz Group, which owns and operates over 1,800 drug stores in North America. As of March 2012, Forbes estimates Katz’ net worth to be $2 billion, ranking him 13th in Canada, and 634th in the world. Born and raised in Edmonton, Katz is the quintessential local-boy-who-did-good story. He attended the University of Alberta. Started his business in Edmonton and later built a $20M dollar home overlooking the Edmonton river valley. But most importantly, Katz is a longtime fan of the Edmonton Oilers. And when the opportunity arose, Katz quickly acquired the team in 2008, much to the delight of Oiler fans. Up until 2008, the team was owned by the Edmonton Investors Group (EIG), a collection of more than 30 local business people who raised the funds required to keep the team in Edmonton ten years prior. Peter Pocklington was prepared to sell the team to Les Alexander, who would have immediately moved the team to Houston, Texas (Weiner, 2007). Oiler fans were relieved that the team would stay, but during the EIG’s ownership period, the Oilers were still considered a small market club that could not spend as much as larger market teams such as New York or Detroit. With no salary cap in place, the Oilers were hard-pressed to attract top players. The constant fixture in any topic of conversation regarding the Oilers during the EIG’s ownership period were the teams financial woes. The passionate fan base, the history of hockey in Edmonton and the past success of the Oilers took a backseat to the business side of the game. The 2005 Collective Bargaining Agreement (CBA) between the NHL owners and the NHL Players Association, which required the 2004-2005 season to be cancelled because of negotiations, did provide some benefits for the Oilers as it resulted in a salary cap system that restricted teams from spending over a pre-determined amount. The Oilers were on a more level playing field, and even attracted top players such as Chris Pronger and Michael Peca in 2005. But this new CBA, combined with an appearance in the 2006 Stanley Cup Final, was not enough for the EIG to continue their ownership of the Oilers. Rumours began to surface that some members of the ownership group were ready to sell. Daryl Katz let it be known publically that as a longtime Oiler fan and Edmonton resident he was ready to take ownership of the team (CBC News). After his initial offers were turned down by the EIG, Katz increased his bid along with promises to keep the team in Edmonton, build a new arena and develop a competitive hockey team. Katz also had the support of past Oilers, who publically supported Katz ownership aspirations (MacKenzie, 2008). On February 8, 2008, the EIG accepted Katz’ offer of $200 million (CBC News). On top of that, Katz offered another $100 million to go towards the development of a new downtown arena and a potential practice facility at the University of Alberta. For the first time, the Oilers could focus more on the game and its fans, rather than the financial issues. Money was no longer, it seemed, to be an object. A fellow fan had come in and accomplished what many fans can only dream of: owning their favorite NHL hockey team. Katz very quickly connected and integrated with the Oilers fan community. 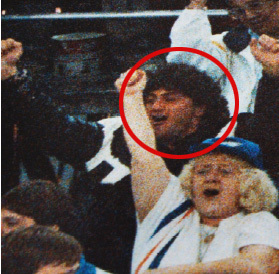 Images of Katz attending games as a youth began to surface. His relationship with former players were public. And he demonstrated a deep respect for the history and tradition of the Oilers. All of these endeared him to the fan community, who viewed him as ‘one of us’. His wealth, and his financial investments in the team were public, but it didn’t seem to matter in his relationship with Oiler fans. Because of his integration with the fan community, he was able to connect at a social level. As a fan, he had a common bond. Even though he was making money from fans, there was no talk of any financial exchanges. The ‘fan’ side of Katz was much more prominent than his ‘owner’ side. These social norms, which are the “standards of behaviour that are based on widely shared beliefs how individual group members ought to behave in a given situation” (Fehr, 2004), are prevalent in fan communities. And it is these norms that Katz did a remarkable job developing and nurturing when he bought the Edmonton Oilers. Katz with NHL Commissioner Gary Bettman. Source: CBC News. Fast forward to today. Katz and the Katz Group have been negotiating a deal with the City of Edmonton to build a downtown arena in Edmonton for over four years now. Over the course of those four years, there have been countless city council meetings, public engagement sessions and numerous research reports. Countless articles have been written arguing for and against a new arena and who should pay for what. Every medium possible has been used to distribute information, with very little progress being made. The debate about who should pay, how much should be paid and who will benefit financially continues today. Katz has used his positive relationship with Oiler fans to garner strong support for the downtown arena development. As a fan of the Oilers and a resident of Edmonton, people assume he’s doing what’s best for the team and he’s doing what’s best for the city. It’s a fair assumption considering how much he claims to love the Oilers and the premium he paid to purchase the team. Even though Katz appears to be closing in on a settlement with the City of Edmonton, the project has ran into numerous delays because of negotiations. And in an abrupt attempt to force the City to make a decision, Katz and his group made a trip to Seattle. I can confirm that Daryl Katz, Patrick LaForge, Kevin Lowe and others from the Oilers leadership group are in Seattle for meetings and to attend the Seahawks game. Nonetheless, and as the City of Edmonton is aware, the Katz Group has been listening to proposals from a number of potential NHL markets for some time. After more than four years of trying to secure an arena deal and with less than 24 months remaining on the Oilers’ lease at Rexall Place, this is only prudent and should come as no surprise. The relationship Katz fostered with Oiler fans, including the social norms that both parties shared, was gone. No longer was the arena debate about a fan who wanted an arena for his city to be proud of. Now, the debate was about an owner taking the team away from a fan base he claimed to be a part of. The norms associated with his relationship to the fan community were replaced by market norms, which include financial costs and transactions. A fan-to-fan relationship is about individuals holding a common ground, with collaborative traits, while an owner-to-fan relationship involves market traits. How could a supposed fan be willing to move their team to another city? It was clear that the threat to move the Oilers to Seattle was a negotiation tactic. The Oilers are in a strong hockey market, supported by a thriving economy and a deep historical connection to the game. Add to the fact that other NHL teams are eager to re-locate, and it is difficult to envision the Oilers moving anytime soon. That did not however, stop fans from comparing Daryl Katz to former owner, and all round sleaze bag, Peter Pocklington, who is currently fighting allegations of fraud. Katz quickly realized his err in judgment and publicly apologized. It was an attempt to re-connect with the fan community as a fan. He tried to demonstrate his common ground with the fan. But it was too late. A public threat to move the club ruined his reputation as a fan, and solidified his role as the owner. The second he highlighted the importance of money to his operation of the hockey club, and disconnected himself from the values shared by the fan community, he changed the norms of his relationship with fans. And as found by Ariely (2008), once the norms change from social norms to market norms, it is near impossible to revert back. The relationship he has with the Oiler fan base may not matter to Katz. Edmonton will continue to be a strong hockey market (Ozanian, 2011). Games will continue to sell out, merchandise will be purchased and sponsorship won’t be hard to find. What impact Katz may feel, now that he’s an owner more than a fan, is the public support of the downtown Edmonton arena. The additional concessions Katz may seek will be from an owner, not a fan, so it will be difficult for Oiler fans to connect with his ideas. For example, if Katz asks for taxpayer dollars to go towards an outdoor hockey-themed plaza, fans may see this as a business idea, rather than one inspired by a passionate hockey fan. This is, after all, an owner who is ready to move if he doesn’t get the money he wants. Ariely, D (2008). Predictably Irrational: The hidden forces that shape our decisions. Harper Collins: USA. Fehr, E. and Urs Fischbacher. (2004). Social norms and human cooperation. Trends in Cognitive Sciences, 8(4), p. 185-190.